Substance abuse—involving drugs, alcohol, or both—contributes to a number of negative health outcomes. It is associated with a range of destructive social conditions, including family disruptions, financial problems, lost productivity, failure in school, domestic violence, child abuse, and crime. In 2011, 31.8% of adolescents age 16 to17 reported using alcohol or illicit drugs during the past 30 days, more than 6 times the rate for adolescents age 12 to 13. 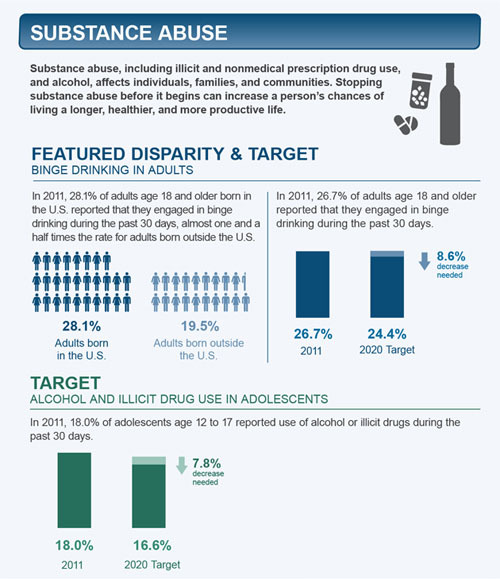 In 2011, 18.0% of adolescents age 12 to 17 reported use of alcohol or illicit drugs during the past 30 days. In 2011, 26.7% of adults age 18 and older reported that they engaged in binge drinking during the past 30 days.